~ Hard work paying off for you? 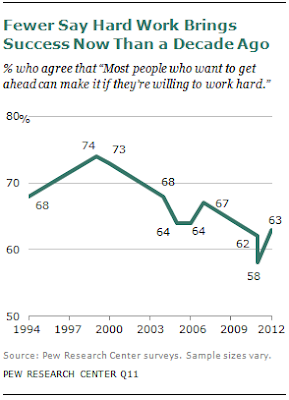 Pretty much everyone I know works harder, often much harder, today than they did 10 years ago. Over the past decade, the Great Recession, a housing market collapse, an unemployment surge and an anemic recovery have squeezed the middle class. An overwhelming majority of middle-class Americans (85%) say it is more difficult today than 10 years ago for those in the middle class to maintain their standard of living, according to a Pew Research Center national survey of 2,508 adults.